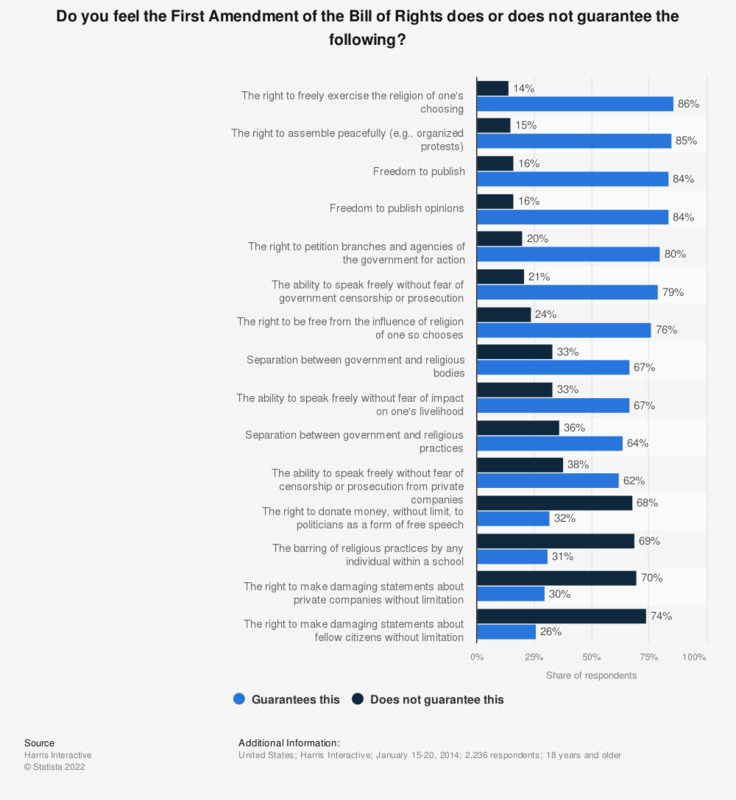 This survey, conducted by Harris Poll across the United States in January 2014, shows public opinion in U.S. regarding the rights guaranteed by the First Amendment of the Bill of Rights. 84 percent of Americans felt that the freedom to publish is guaranteed by the First Amendment of the Bill of Rights. "Please read the following passage from the Bill of Rights. 'Congress shall make no law respecting an establishment of religion, or prohibiting the free exercise thereof; or abridging this freedom of speech, or of the press, or the right of the people peaceably to assemble, and to petition the Government for a redress of grievances.' Now, for each of the following, please indicate whether you feel the passage does or does not guarantee it." Evaluation of Black Americans' civil rights in the U.S.
How concerned are you about protecting freedom of speech? Black Americans: Do you feel civil rights for blacks in this country have improved, stayed the same, or worsened? If you were a Member of Parliament, would you be in favor of voting for the Bill on Civil Unions?